View Cart "2 levs, 2013, 110 Years since the Birth of Zlatyu Boyadzhiev" was successfully added to your cart. 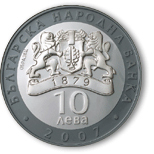 The obverse of the coin features the BNB logo and the year ‘1879’ on the strip; the inscriptions ‘БЪЛГАРСКА НАРОДНА БАНКА’ (Bulgarian National Bank) and the year of issue ‘2016’ in circumference, and the nominal value ‘10 ЛЕВА’ (10 levs) between them. The reverse features an image of a railway station and a train composition; the text ‘150 ГОДИНИ’ (150 Years), ‘ПЪРВА ЖЕЛЕЗОПЪТНА ЛИНИЯ В БЪЛГАРИЯ’ (the First Railroad in Bulgaria) and ‘РУСЕ – ВАРНА’ (Ruse – Varna) inscribed on two lines in circumference.